Randi J. Walz | Fafinski Mark & Johnson, P.A. Randi has worked in the legal field for more than 20 years. She has worked for both large and small firms, as well as independently. Randi has assisted in several trials throughout her career and has experience in corporate, aviation, employment, personal injury and family law, as well as class action litigation. Randi and her husband recently moved back to Minnesota after a decade. 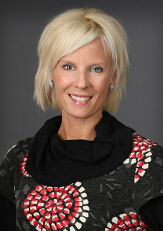 She rejoined FMJ after 11 years of running various businesses in North Dakota. She and her husband have two boys, Matthew and Michael, who keep them busy with hockey, football, baseball, and lacrosse. She and her husband Shane own and operate a CrossFit Gym in southwestern North Dakota and enjoy boating, skiing, biking and hiking when they are not cheering on their boys at activities.